The Antipodes Moisture Boost MINIs (Divine Face Oil Avocado Oil & Rosehip 10ml, Vanilla Pod Hydrating Day Cream 15ml) is an effective combination of treatments to hydrate, protect and rejuvenate dry to combination skin types, for overall replenishment. 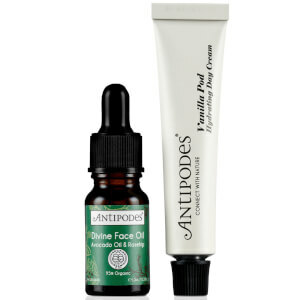 To be used as part of a regular skin care regime, the facial oil treatment works to keep skin firm looking and protected, while the hydrating cream keeps skin hydrated and clear. This luxurious facial oil has been scientifically proven to stimulate Type 1 collagen in the complexion's skin cells by up to 51% for firmer skin. Packed full of antioxidants and vitamins found in the avocado oil in the formula, skin is protected against environmental damage whilst also being kept hydrated and soft by the added rosehip oil. Leaving a refreshing light jasmine and sweet orange scent, it smells as good as it feels. The vanilla and mandarin fragranced hydrating day cream not only uplifts your senses, but it also intensly moisturises with its lightweight formula without clogging pores. Manuka honey has been added to the formula to keep skin clear and blemish free with its antibacterial properties.